Last week I showed you how I dried spent grains from Engineer's brewing adventures. Once I had dried out some of the grains, they smelled very much like Grape-Nuts cereal. Now that's something I could do with them. I made granola out of the grains and since it takes so long to bake, I didn't even dry them out first. I had a turkey in the oven on low for 8 hours and figured that while the oven was on, I might as well throw in the granola. 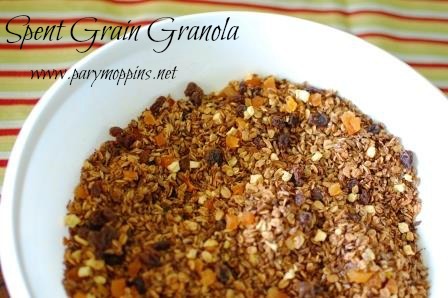 This recipe makes a TON of granola. It might be fun to give as favors or a hostess gift. Mix the grains, oats, flax seeds, and cinnamon in a big bowl. Bring coconut oil and honey to a boil then cut off heat. Stir in the vanilla then pour the liquid ingredients over the solid ingredients and mix together. Line a few sheet pans with parchment or spray with non-stick cooking spray. Pour the mixture into the pans and spread to about a 1" thickness. Cook at 200F for 8 hours (overnight is the perfect time for this) and check to make sure it is fairly dry. Once cooled, keep in an airtight container. Don't forget to enter the pasta giveaway! This is part of Full Plate Thursday, See Ya in the Gumbo, and SITS. I make granola pretty regularly and this was a fantastic way to use lots of the spent grains. Thanks for stopping by! Pary, your Granola looks awesome,wish I had a taste or a hand full. Hope you are having a fantastic weekend and thank you so much for sharing with Full Plate Thursday! I had no doubt you'd find something cool to make with your grain! For the record, I like grapenuts. Reminds me of my grandpa who ate them for breakfast often. But granola does sound better. I like Grapenuts too and these grains definitely have the crunch of Grapenuts. Thanks for stopping by!